(Nanowerk Spotlight) The use of renewable resources (biomass) as an alternate source for fuel and the production of valuable chemicals is becoming a topic of great interest and a driving force behind research into biorefinery concepts. In the early parts of the 20th century, most nonfuel industrial products such as medicines, paints, chemicals, dyes, and fibers were made from vegetables, plant and crops. During the 1970s, petroleum based organic chemicals had largely replaced those derived from plant materials, capturing more than 95% of the markets previously held by products from biological sources. By then, petroleum accounted for more than 70% of our fuel. However, recent developments in biobased materials research show prospects that many petrochemical derived products can be replaced with industrial materials processed from renewable resources. Researchers continue to make progress in research and development of new technologies that bring down the cost of processing plant matter into value-added products. Rising environmental concerns are also suggesting the use of agriculture and forestry resources as alternative feedstock. Being able to develop soft nanomaterials and fuel from biomass will have a direct impact on industrial applications and economically viable alternatives. Researchers already have used plant-derived resources to make a variety of soft nanomaterials, which are useful for a wide range of applications. Today’s biobased products include commodity and specialty chemicals, fuels and materials. Some of these products results from the direct physical or chemical processing of biomass such as cellulose, starch, oils, protein, lignin and terpenes. To exploit the chemical diversity, scientists will need to gain more knowledge of the plant genes and regulating these biochemicals. Also, continuing growth of this industry will depend on developing new markets and cost-competitive biobased products. In a recent paper titled "Design and development of soft nanomaterials from biobased amphiphiles" Professor George John and Dr. Praveen Vemula present the novel and emerging concept of generating various forms of soft materials from renewable resources. In this account they summarize their continuing efforts in that direction, and a few successful examples from their work. 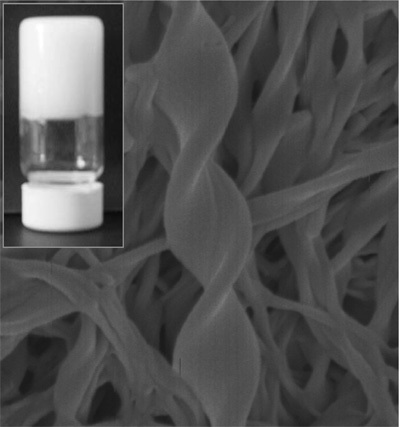 In particular, they explain how one can design and develop soft nanomaterials such as new surfactants, molecular gels, liquid crystals, self-assembled organic nanotubes, twisted fibers and helices. Since, these materials are well known for various applications, generating them from renewable resources could have a significant impact on production technologies and economies. John, who is Associate Professor in the Department of Chemistry at The City College of New York, explains his research efforts to Nanowerk: "Intriguingly, by combining biocatalysis with principles of green and supramolecular chemistry, we developed building blocks-to-assembled materials. We foresee that our results will encourage interdisciplinary collaboration between scientists in the fields of organic synthesis, soft materials research, green chemistry and drug discovery to design and develop various biobased functional materials from underutilized plant/crop based renewable feedstocks." In one example, John used cashew nut liquid, an industrial by-product, to synthesize cardanol-based glycolipids. These could be self-assembled to generate a variety of soft nanomaterials, such as helical fibers and tubes, gels and liquid crystals. John said the nanomaterials have a wide range of applications, such as smart gels for sensing, electro-optical displays, lubrication industry, cosmetic formulations, biomedical applications and oil recovery. John points out that he and his colleagues already have published several articles on this new concept, combining the philosophies of green chemistry and principles of supramolecular chemistry, to generate nanoscale architectures and materials such as liquid crystals, gels, helical fibers and tubes (see: "Enzyme Catalysis: Tool to Make and Break Amygdalin Hydrogelators from Renewable Resources: A Delivery Model for Hydrophobic Drugs". In another example, the researchers started with amygdalin, a by-product from the apricot industry and used an enzyme catalysis route to make amphiphiles – molecules with both hydrophilic and hydrophobic parts – that have very effective gelation properties, even before purification. To take these soft materials to the next level, the researchers explored and successfully demonstrated the utility of these hydrogels as drug delivery vehicles. Enzyme catalysis was used as tool to make and break the hydrogels, which apparently triggered controlled drug delivery. "This study at the molecular level facilitates the new developments in science and technology via nanotechnology" says John. "Our primary goal is to understand the structure-morphology correlation of amphiphiles on self-assembly and their uses in medicine, biosensing and environmental benign applications." John is very optimistic about the prospects of this field: "As this budding field is in initial stage at present, we could foresee enormous potential and urgency for this approach due to significant decrease of petroleum resources. It suggests the need for alternate feedstock for developing fuel, nutraceuticals and other materials." However, there are a few challenging hurdles to be overcome. One would be the development of a suitable process for extracting and separating starting chemicals from different bio resources. Most challenging would be the design of suitable building blocks including all basic functional arms in supramolecular synthons. Last but not least, it is equally important to design new chemical plants which could process oxygen containing renewables, unlike the present hydrocarbon intense process industry. To continue on this route to using biomass on an industrial-scale, John believes there is an urgent need for education in the area of energy efficient sustainable chemistry, biomineralization and biomimetics. "Considerable input has to be involved to the most effective ways of introducing such materials into the chemical curriculum and to didactic expositions" he says.